"A vacant lot will become a winter wonderland on Leap Night February 29, 2008 from 6-11 p.m. The free event open to the public will be held at 1100 Old River Road (between Main Avenue and Front Street). Leap Night will feature a snow and ice installation, a winter forest complete with costume bears, music, bonfires, performances by SAFMOD, Cleveland’s multi-media performance ensemble, an ice skating rink, a snowboard ramp and rail jam competition, an outdoor Rock BandTM video game competition, a snowsuit fashion show, and food and drink vendors. The site offers ample free parking and convenient access via the RTA Waterfront Line, East Bank Station." Classes on One Color Screen Printing will be held at the Silverthorne Creative Art Center in Rocky River on March 8 & 9. Both classes will be from 9am - 4pm and students will learn how to take a black and white image and turn it into a silk screen that they can take home to reuse over and over. 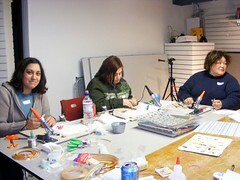 Interested participants can call Silverthorne Gallery/Grand River Beads at (440) 331-7410 to register. Space is limited! More info on the class can be found on the March Calendar page on their website. Other questions regarding materials, etc. can be emailed to nicki at reflectionchildren dot com. The 2008 Spring Boutique will be Friday, April 11 from 7 to 9 pm and Saturday, April 12 from 9 am to 1 pm at the Rocky River Memorial Hall, 21012 Hilliard Blvd, Rocky River OH 44116. 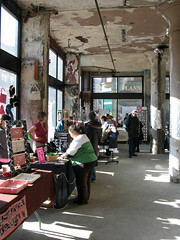 There will be a mix of artists, crafters, and vendors (Mary Kay, Tastefully Simple, and Home Interiors). Please Note: the jewelry category is full, and the deadline to apply for a table is March 14th. You can get an eight foot table for $20. the party is in Olmsted Falls (about 5 minutes from the Great Northern exit off of 480.) please convo lazymamadesigns to rsvp and receive directions to the lazy-lair. thanks so much for all of the volunteering that has been going on! It seems everyone had the same idea! Thanks zJayne and ValerieTyler for the Clevey love. the teams section of etsy has a ton of new updates, and a bunch of new tools in the resources section. try out the bannerator which makes great looking banners for your shop from pre-made templates and the words you choose. the downloads section has all kinds of buttons and logos to put on your blog or print out, "on vacation" avatars and banners and even avatar frames to tell people you are having a sale without changing your identity ;) there is even a link to moo cards which lets you take images right from your shop to make all kinds of printed goodness. check it out, and thanks etsy! I think it would be nice to include etsy mini's on our team myspace page. If you would like to have your etsy mini on the page then please convo me through etsy StrawberryLemonade.Etsy.Com with your shop number. This can be found in the URL when you are viewing your shop. It will save me some time if you can find it, but if you are lost then let me know I'll look it up for you. If a lot people are interested then I might decide to rotate etsy mini's weekly or something like that. I will let you know when I find out how many people want in. Front Page Sighting - CopperLeafStudios!! Gaspeth!! can you say that on tv? YAY! 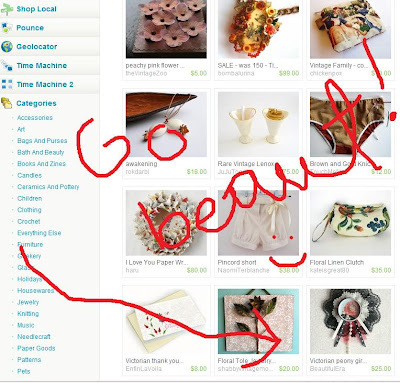 Tricia of LazyTcrochet has volunteered to be our official team treasury reporter! please send her a convo if you make a team treasury and would like it posted here. what is a team treasury? it's a treasury where at least half of the items are from cleveland handmade members and the curator's items are not featured. ps-we are still looking for volunteers to manage the cleveland handmade myspace and indiepublic pages, so let me know if you are interested: smashing at cox dot net. the weather outside was frightful, but all these smiley cleveys made up for it! they went home, but you can still see their work on display for the rest of the month at The Silverthorne Gallery in Rocky River.